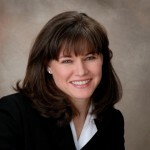 Mother, author, publisher and inspiration: Michele Bondi Bottesi shares her journey and talks about the process of creating Catholic literature and the importance of keeping faith. I like the fact that when you are self-described first as a mother, then Catholic author and publisher, then psychologist. I think our current society (2010) is wrapped-up in labels, and not enough in vocations. How long have you been writing and publishing, and what (or who) inspires you to write? I agree; we must be very careful to remain willing to do what God asks of us and not rely upon our own understanding. Throughout the lifespan we are called to integrate multiple roles simultaneously. The vocation that will always mean the most to me personally is the one that I was called to first and foremost, the Holy Apostolate of Motherhood. I love that fact that that the job description is a mile long yet the title is humble, there are no prerequisites to getting the job, no degree is required, payment doesn’t involve money, God is the Boss, and He’s very nice. As I child I loved writing and creating little books. In elementary school one of my books was entered into a contest and I prayed that it would win first place. That book didn’t win, but the event was prophetic. Decades later, God commissioned me to write and publish a series of books that focus on our purpose in life from a Catholic perspective. In the last three months, those books have been honored with four first place awards. In between my writing as a child and then again as an adult, four pivotal events occurred that were crucial to my formation and prepared me for the work God wanted me to accomplish through Joseph Karl Publishing. The first one was the death of my father during my senior year of high school, which led me to abandon my greatly anticipated plans of going away to school to study journalism. Instead I chose to remain home with my mother, applied to a local university, and without even knowing why changed my major to psychology. After earning a bachelor’s and a master’s degree in psychology, I was accepted into the doctoral program in educational psychology at the same university. I completed the coursework and the written and oral exams required for the degree. When it came time for my final requirement, the dissertation, I was surprised to encounter resistance by some members of my committee. That resistance increased and my committee created extra requirements not given to the other students, and they seemed impossible to carry out. I worked very hard and met them all. Then the second pivotal event occurred. I prepared my dissertation proposal, defended it, and my committee approved the work. Later that day, the committee acted against the decision they made in good conscience. They reversed their decision to accept the proposal and I was not allowed to finish that last requirement necessary to obtain my degree. Even though I still had a one year grace period left to meet their requirements, I was denied that as well. No formal justification was given to me, not even when I requested it in writing as I prepared to take the department to court. It was as if roadblock after roadblock was placed directly in my path and eventually, there was no possible way to move forward in that direction. The court battle never materialized, because right after I was denied my degree, the third pivotal event occurred. My three small children and I stopped by our mailbox on the way to the store and discovered that I had been served divorce papers. They had been filed on my birthday. For seven years before, during, and after my divorce my family was persecuted terribly, and it was during that time I experienced unprecedented supernatural events. It was during my divorce that God summoned me to write a book. He placed the contents of the book on my heart, and although I knew it was there, I did not know the contents of the book until I started writing it. Being aware of the presence of the book helped prepare me over time for the work that was coming, and I had to wait for His most perfect timing to begin writing it. It was impossible to begin the book immediately because for years my focus was on surviving each difficult day. At the t ime I felt that my time, energy, and financial resources were being stolen from me, until I was granted an understanding that everything belongs to God, and my experiences were vital to the work that was coming. What Satan meant for evil, God was using for great good. All I had to do was cooperate. Several years later I was standing by my computer in the living room reading a letter from Priests for Life when I heard, “I want you to do more.” When I inquired what I was supposed to do exactly there was no response, but it soon became clear that the time had come to write the book. Things progressed rather slowly. Then one day I learned of a man whose wife filed for divorce; in great despair he ended his life on Christmas Day. That was a fourth pivotal moment, and led me to finish writing Your Personal Apostolate: Accepting and Sharing the Love of God. Those three pivotal events were catastrophic, and yet they had great purpose because they shaped and prepared me for the work God wanted me to accomplish down the road. Each of us has an apostolate that begins the moment we are created. We are called by God throughout our evolving apostolate to be sacrificial and obedient, always striving to love in greater measure. We are reminded that all we do should be for the glory of God and salvation of souls. After that book was finished in the spring, I was at a children’s Mass when God instructed me to rewrite the book for teens, preteens, and younger children. That summer my teen and preteen sons Andre and Nick wrote those books with me and they were published in December 2009. God commissioned other books along the way, including God Moments: Stories that Inspire, Moments to Remember and Our Treasure. He also requested that One Man’s Journey to Freedom: Escape From Behind the Iron Curtain by Gene X. Kortsha be immediately prepared for publication for a global audience. That life-changing book was just nominated for a Pulitzer Prize in Letters. My writing mentor in heaven is Archbishop Fulton J. Sheen. Other intercessors have been Pope John Paul II, St. Pio, St. Therese, and Venerable Fr. Solanus Casey. During our second year, St. John Bosco joined us to guide the work of our youth division. St. Anthony and St. Michael have been of tremendous help to us this year. This past spring, God instructed me to take my children to Holy Mass on weekends at Ss. Cyril and Methodius Slovak Catholic Church here in Michigan. While that came as a huge surprise to me, we have already experienced tremendous spiritual growth as members of the parish, and Fr. Ben Kosnac has been instrumental in helping us achieve the work God wants us to accomplish. There is one more pivotal event that I did not mention. While I was still married, I asked God to make me a saint. Do you think your background in Psychology and Neuropsychology helped shape your observations and paths along the way? Without a doubt, Divine Providence led me to study psychology, for it is the study of human behavior that helps me so much in my work today. Our mission is to know God, love Him, and serve Him. The study of the development of the human person is so vital to our understanding, respecting, and serving each other throughout the lifespan. My absolute favorite theory is attachment theory. The research clearly shows, and it makes perfect sense, that outcomes for people are best when they are loved and nurtured. This coincides with what God asks of us, because we were created in love, to be loved, and to love in return. How has faith helped to fill in the gaps that science may not have answers for? The more we seek to accomplish our own will, the more limited is our understanding. When we demand proof to satisfy our pride, or look to change what God has determined is Truth, we then see even less. Pride creates a barrier between us and Truth, and that is why obedience is such an important virtue for us to acquire. We must be on constant guard against arrogance. Learning for the sake of serving God is honorable and accomplishes great good. When we practice humility and obedience, and pray to the Holy Spirit for wisdom, we come to know the Truth we seek and are content to know and accept the Truth set forth by God. Michigan has been hard hit in the last few years. Even though I am in New Jersey, I have close friends that live in Lake Orion, Novi, Pontiac, Oxford. Thinking in terms of a personal apostolate, what can folks learn now as they see neighbors losing homes and may be struggling to put food on the table? Faith is surely being tested. We must ask God to help us see these circumstances from His perspective, and grant Him permission to work in us in good times as well as during hardships. It is vital that we allow ourselves during times of great trial to grow in ways that at times are hidden from us. From our perspective we may feel alone and inconsolable because our hearts are broken. However, when we abandon ourselves to the will of God, much good is accomplished for ourselves and for others. We must not rely upon our own limited strength and understanding to get us through these trials. It is important to remember that every apostolate is constantly evolving through all the circumstances of one’s life. A Nine-Day Novena to the Holy Spirit is very beneficial during times of discernment and also comforting during times of suffering. What inspired Joseph Karl Publishing? God founded JKP, He is the genesis of all of our work, and everything we do relies entirely upon Divine Providence. By the end of this year (2010) we will have published six exceptional books and more life-changing reading is in development for 2011 and beyond. Our mission is clear: to encourage, inspire, and continue the faith formation of the more than one billion Catholics around the world and to lead souls to Christ. God wants every single one of us to know how much we are loved and valued, and that we are to recognize, accept, return, and share His love with one another. How do you find the time to post on your blog so frequently (very impressive!)? God inspires the stories, articles, interviews, videos, and photographs. In the beginning, we shared a very sweet exchange every time He gave me an assignment. It went this way: He presented the idea and I responded by asking Him, “When am I going to have time to do that?” Then He would provide more inspiration and I would end playfully with, “You write it.” That playful banter helped me get accustomed to accomplishing God’s will through Joseph Karl Publishing. During this second year there has been an increased sense of urgency to the work along with an understanding of how vital it is for us to cooperate with God’s will. We must take heed, for often we allow ourselves to be fooled into thinking that there is plenty of time later for holiness, self denial, and service. We must understand that our cooperation is not meant to benefit just ourselves, but also benefits others who may be in need of our cooperative response the present moment. Our choices impact our own spiritual welfare as well as the spiritual welfare of countless others. We tend to not realize, underestimate, or even reject the tremendous, incalculable impact our choices make on so many others. This past year of increased urgency, we must pray that every individual be willing to “see” as God sees and not rely upon our own understanding. He has a mission for every single person. Each of us must strive to journey ever close to Him in order to properly discern our evolving apostolate and carry out the work He has for us to accomplish each day, moment by moment. Being responsible stewards of our time is vital to our discipleship, and that is a tremendous challenge in our modern era. In order for God’s will to be accomplished through me, my entire life revolves around participating in Holy Mass every day I can possibly attend. Many people feel that they do not have time to go to Holy Mass, or like me, never even considered it. I friend of mine recently observed very poignantly that when we put God first, He helps us through our day so we can accomplish what He asks of us. What I love the most about Joseph Karl Publishing is that God is clearly the genesis of all our work; through the work we see manifested His unfathomable love for every single person. The idea to include my children in the mission belongs to God, and was the answer to prayer. As a parent and especially as a single parent, I am painfully aware of the forces of darkness pursuing our children in the modern era. They are constantly tempted to spend time on useless activities and to seek joy in material things, while disobedience, arrogance, and selfishness are marketed to them as desirable behavior. There are many activities which appear so appealing and seem so benign, but the reality is they are extremely harmful. This is very, very alarming. As I mentioned, the assignment to write the youth apostolate books was given to me during a children’s Mass. That summer my teen and preteen sons worked with me on the text and wrote the personal reflections from a teen and preteen perspective. We are absolutely delighted with those books because they share the apostolate message with young people, and encourage them to accept, return, and share the love of God throughout their lives. 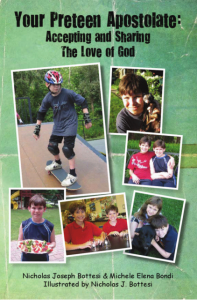 In June 2010, Your Teen Apostolate and Your Preteen Apostolate were named Best Children’s Books of the Year and Best Family Life Books of the Year by the Catholic Press Association of the United States and Canada, and in September 2010, Your Preteen Apostolate was honored with a Purple Dragonfly Children’s Book Award. Final placements will be announced in November 2010. Allowing God to work through them to create these books has helped my children gain a greater understanding of the sacrificial nature of our walk with Christ. They also have begun to develop time management skills as they consider their obligation to be responsible stewards of the time they are given. Thank you for your kind words about Andre’s article. Hopefully Andre and Nick’s accomplishments lead them and their peers to understand that God is at work in them, too, not just someday but right now. Their contributions are already vital and contribute much to our world. No wonder your blog is a success; you share your experiences with the reader — through words, photos, thoughts and actions. What new topics are you looking to share with your blog readers? Joseph Karl Publishing’s mission is to encourage, inspire, and continue the faith formation of Catholics around the world and to lead souls to Christ. One vital way to accomplish that is to reach out people during very difficult, painful times in their lives. Often times we do not realize the tremendous benefits that are obtained for us and others when we chose to do God’s will in the present moment. My favorite ways of encouraging, inspiring, teaching, and leading souls into greater intimacy with Christ is through the use of short stories, photographs, and short videos. I plan on writing more about major life changes including death, divorce and single parenthood, career transition, illness, and death. I would like to offer more material for grandparents and seniors. Also look for material that reaches out to those who have left the church, lukewarm Catholics, and those looking to become Catholic. We live in a time when so much information is available to us, but not all of it is true. We must be willing to seek and accept Truth, which leads to authentic and lasting joy. I also feel very strongly about encouraging the faith formation of devout, obedient Catholics pursuing greater Divine Intimacy. By the way, I am so glad you posted Father Calloway’s presentation! I am delighted that you enjoyed the video clips of his presentation. Fr. Calloway’s testimony is very powerful and demonstrates God’s great mercy and tremendous love for each one of us. We are also reminded of the power of prayer to change lives, and that each one of us is necessary. What can other folks do to help inspire and create new relevant Catholic content? We must be open to allowing God to work in us. Often we stop or hinder this process because of pride, our faith is lacking, or we do not reverence His judgments. How often we rebel, disrespect His timing, and refuse to serve Him in the present moment. I encourage everyone to go to Holy Mass, receive the Eucharist, and go to Reconciliation often. If we ask and then listen, God will tell us how He wants us to serve Him. We must remember that it is very important for us to help others with their apostolate and not focus exclusively on our own particular mission. What is next for you and for Joseph Karl Publishing? We published the first three apostolate books in the series in 2009. Our next book, God Moments, will be published and available the first week of October 2010. Two more books are headed to publication by the end of the year. Our Treasure is a keepsake picture book that reminds children that the Eucharist is our greatest treasure on earth. The exceptional illustrations for this book are by gifted artist Kristina M. Pope. One Man’s Journey to Freedom: Escape From Behind the Iron Curtain by Gene X. Kortsha is a brilliant memoir and has been nominated for a Pulitzer Prize in Letters. This life-changing book will be available by December 2010. Every book that we have published is an expression of Christ’s great love for every single person ever created. We are eager to meet the people He will send to accomplish the work that is to come, as Divine Providence provides for our needs. 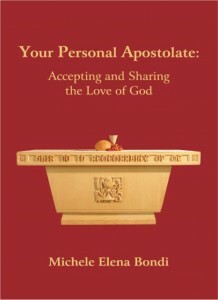 Four more books in the apostolate series, the sequel to God Moments, and a series of prayer booklets addressing specific trials are in development for 2011.
you are the best congratulation Michele Bondi.